Size 10 Big Hero 6 Children's Spring/Autumn Pyjamas. This two piece Big Hero 6 pyjama set is 100% cotton. These Big Hero 6 pyjamas have a long sleeved top with an Big Hero 6 print, round neckline and come with matching grey long pants. Great pyjamas for Big Hero 6 fans. 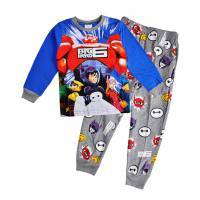 These Big Hero 6 Pyjamas are also available in Size 2, Size 3, Size 4, Size 6, and Size 8.